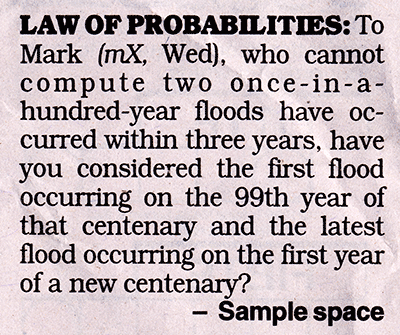 Let's start with the basics: a "once-in-a-hundred-year flood" has a probability of occurring in any given year of 1% or, another way, the chance of not flooding is 99%. We can expand this formula to answer the question postulated in the letter above. The possibility of have 2 floods in 3 years is only 0.03% ( ). This has a chance of happening once every 3367 years. Although we don't know how many floods will come in the years ahead. Of course, there is the possibility that the original calculations were wrong and these floods should happen more often naturally. Otherwise there's a 26.4% chance that we'll have more than 2 floods this century which are a lot higher than one-in-a-hundred to most people.